It consists of a long interview with Sara Bocchini, in which Richard details his artistic and personal journey. Sipping a cup of coffee, recalling anecdotes, meetings, and conversations with vivacity and enthusiasm, Richard Weber takes the reader by the hand and accompanies them on a journey through time: from his beginnings as a make-up artist in the Prague film studios, to a professional mime in the Theatre on the Balustrade (Divadlo Na zábradlí); from meeting Dimitri, to their decision to create a school together; from the first years of the school’s existence in Verscio up until today, through the milestones that have marked the development of the pedagogy he created for the teaching of the theater of movement. The interview is further enriched by a selection of images from Richard’s archive, which documents both his career as an actor and moments from the life of the Accademia. 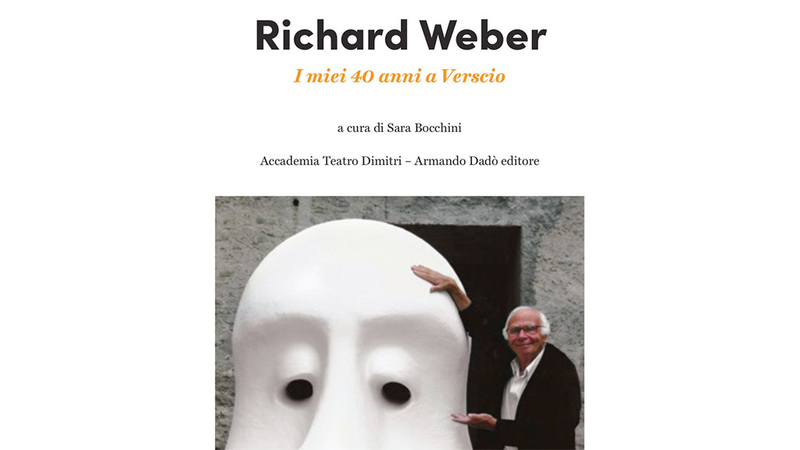 Forty years after the founding of the Accademia Teatro Dimitri, in the words of Richard Weber, the curiosity, the dedication, and the adventurous spirit which accompanied him through a lifetime dedicated to the theater remain intact. Emerging between the lines is a portrait of an artist and teacher with a magnificent fantasy, whose enthusiasm for teaching and passion for the profession profoundly inspired the development of the Accademia. The volume will be presented by the curator Sara Bocchini on Sunday, September 23 at 14:00 at the Teatro Dimitri in Verscio, in the context of the Festival of artists trained at the Accademia Teatro Dimitri. Admission is free.